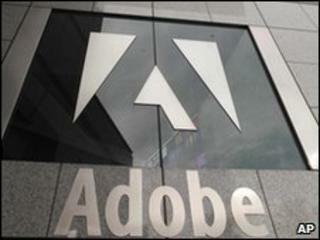 Adobe has launched its latest salvo in an ongoing dispute with Apple. The co-founders of Adobe have published an open letter in which they say that Apple threatens to "undermine the next chapter of the web". The software firm has also started an adverting blitz in newspapers and on popular technology news sites. Some of the online adverts contain the tongue-in-cheek slogan "We heart Apple". It follows a letter from Apple boss Steve Jobs in which he defended his firm's decision not to allow Adobe's Flash technology on many of its popular products. Mr Jobs described Adobe's software - used on many websites for video and animations - as a "closed system" and "100% proprietary". "While Adobe's Flash products are widely available, this does not mean they are open, since they are controlled entirely by Adobe and available only from Adobe." Whilst Mr Jobs admitted that Apple also had "many proprietary products", he said that Apple believed "all standards pertaining to the web should be open". Amongst other criticisms, he also said Flash performed poorly when used on touchscreen smartphones and handheld devices. Adobe co-founders Chuck Geschke and John Warnock have now hit back. "We believe that consumers should be able to freely access their favorite content and applications, regardless of what computer they have, what browser they like, or what device suits their needs," the letter reads. "No company - no matter how big or how creative - should dictate what you can create, how you create it, or what you can experience on the web." Adobe's campaign is the latest move in a high-profile war of words between the two companies, which began with Apple's decision not to allow Flash technology to run on some of its popular gadgets such as the iPhone and iPad. In early April, Apple also clamped down on the tools that it allowed developers to use to create applications for the iPhone and iPad. By changing the terms of the licence that software developers must sign when writing code to run on Apple products, the firm effectively blocked developers from using software that Adobe was about to release. The software - Creative Suite 5 -contained tools that automatically translate Flash code into programs that will run on Apple gadgets. Mr Jobs later justified the changes in his letter by saying that experience had shown that it could result in "sub-standard " applications. But Adobe CEO Shantanu Narayen described Mr Job's letter as a "smokescreen" and said the decision had made it "cumbersome" for developers who were forced to have "two workflows". Adobe has said it will stop making the tools. The new letter from the co-founders of Adobe attacks Mr Jobs' assertion that Flash is a closed system. "As the founders of Adobe, we believe open markets are in the best interest of developers, content owners, and consumers." "If the web fragments into closed systems, if companies put content and applications behind walls, some indeed may thrive - but their success will come at the expense of the very creativity and innovation that has made the internet a revolutionary force. The company claims that its software- and particularly Flash - is open. "We publish the specifications for Flash — meaning anyone can make their own Flash player," it reads. "We believe that Apple, by taking the opposite approach, has taken a step that could undermine this next chapter of the web - the chapter in which mobile devices outnumber computers, any individual can be a publisher, and content is accessed anywhere and at any time. "In the end, we believe the question is really this: Who controls the world wide web? And we believe the answer is: nobody — and everybody, but certainly not a single company." In response to the letter, an Apple spokesperson said that the firm also believes in "open web standards" such as HTML5, the latest version of a programming language used to build web pages. "Flash is not an open web standard like HTML. It is a proprietary Adobe product. Just ask the W3 consortium that controls web standards - they have chosen HTML5 as the open web standard to move forward with." Adobe's letter has been published on its website as part of a global advertising campaign. The adverts list a series of technologies that Adobe says it "loves". It ends: "What we don't love is anybody taking away your freedom to choose what you create, how you create it, and what you experience on the web." The adverts have been bought in the New York Times, Washington Post, San Francisco Chronicle as well as the Financial Times and Wall Street Journal. Online, they appear on Wired, Techcrunch and Engadget.